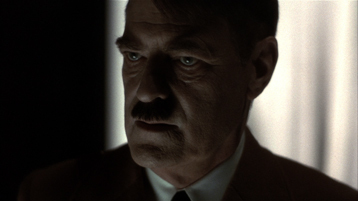 British screen and stage star Norman Rodway portrays the imprisoned Hitler, careening from dark comedy to desperate fury as he re-examines his beliefs, fantasies and deeds. Rodway's previous film credits include playing Hotspur in Orson Welles' Chimes At Midnight, as well as the British features County Kilburn, The Penthouse, I'll Never Forget What's 'Is Name, Four In The Morning, and Keith Gordon's adaptation of Kurt Vonnegut's novel, Mother Night, with Nick Nolte. Rodway has performed with the Royal Shakespeare Company since 1966, with starring roles ranging from the title role in Richard III to Love's Labour's Lost in the USA. His most recent stage appearance was in the National Theatre production of The Seagull. On television, he has taken starring roles in Danton's Death, A Month In The Country, The Critic, Out and the 18-part British series, The Bretts. Some of his recent television appearances include leading roles in Agatha Christie's The Mirror Crack'd and as General Smuts in an episode of The Young Indiana Jones. Described as "one of the great radio actors of his generation" by The Independent On Sunday, Rodway has made over 300 broadcasts for BBC Radio and was named Best Radio Actor in 1980 for his performance in The Faith Healer.